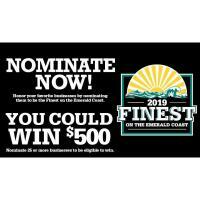 We invite you to nominate your favorites in dozens of categories. If you nominate in more than 25 categories, you'll be entered in a sweepstakes to win $500! Nominations will be accepted January 13th - 27th as the first part of the competition. It's easy to do. Simply choose a category, make your nomination, and fill in your email address. Continue and complete the registration form*. Afterwards, you’ll receive a confirmation email which will contain a link that allows you to auto login each day to nominate again if you wish. *You MUST register in order to vote! The top companies that get the most nominations in each category will advance to the voting round that will run in March. Winners will be recognized in a special print and online section once the voting round has ended and the votes have been tallied and verified.